We're still in Black History month and my chosen cities in Europe continue. Why because as mentioned in a previous piece during this Black History month, wherever I go, it's Black "herstory" because I'm a sister! We're still in Black History month and my chosen cities in Europe continue. Why because as mentioned in a previous piece during this Black History month, wherever I go, it's Black "herstory" because I'm a sister! Beyond travel discussion about the marvelous countries where primarily Black people dwell, I will continue to share my travel journeys, as I have done previously, when discussing Africa and other beautiful places but Europe is a place where Black people travel too so let's go to Italy and the Vatican! While a young girl growing up in Queens, NY, there was a pizza place in a location called Jamaica Avenue that had excellent Margherita Pizza. So delicious! I had an odd way of eating it. I would eat the cheese first, because it was so scrumptious, and then the bread. This pizza feasting led me to always imagine doing so in Italy. Many years later, it was also a place that my daughter desired to visit, so off we went as a family to visit Rome, Tivoli, Assisi, Tuscany, Verona, Pisa, Venice and Florence. There was so much to do and see that the decision was to go on a tour, which I am never fond of doing, so it is rarity for us. However, it did ramp up our ability to see a lot , in a stress free format. Essentially, every aspect of the trip was arranged for us. All we had to do was pack and go! No trip to Italy would be satisfying, in my eyes, without a romantic ride on a Gondola, while viewing the beautiful architecture on the water, after enjoying a Bellini at Harrys. That is some kind of wonderful! It is seemingly impossible not to love this. We did indeed! Venice is a place of joyous frivolity including the glass blowing, carnival masks and constant eating of gelato. I actually could not believe how much gelato our son ate in Italy at large, but Venice was a place to really enjoy it. The Piazza San Marco is a fabulous hangout spot. I absolutely felt like a kid again sitting on the lion pictured below. I can go on and on discussing Venice because I loved it so much. Every moment while there, I felt a sense of aliveness and enjoyed just sitting in cafes sipping and eating until my stomach said ENOUGH already and it was time to walk it off. This is a place to go with family for an assured good time but leave the notion of dieting at home. Your plan should be to eat, drink and be merry! Florence is a very special place. For me, it translated to art as the Uffizi was worth every moment of the time spent there. I was thrilled to see the Birth of Venus by Botticelli, which of course I was excited to do, but there was so much more to see. We also saw David, by Michael Angelo, at the Accademia Gallery (although there is so much more to see beyond it). I wondered if David would be as excellent as I had always imagined it to be and indeed it was. Honestly, I couldn't stop looking at it. The statue exceeded my expectations. The detail is impeccable and we marveled at it for a considerable period of time. This magnificent piece of art is a sight to behold and there is a sense of profoundness while analyzing it. Beyond the museums and magnificent art, there was outstanding architecture, beautiful churches and general impressiveness, everywhere we walked in this city of cities. Of course there was eating too. The thing about Italy is that, no matter where you go, you must eat. You have to convince yourself that the walking will balance it all out and that the most important thing to do is to let go of any notion of feeling guilty. Dieting is not an option. Pasta, bread, pizza, cheese, coffee, pastries--just all of it is there for you to consume and enjoy. No matter where you go, you will see people eating. Just indulge yourself and then walk it off. Florence is wonderful! If you have the opportunity, definitely check it out. We also visited Portofino, as mentioned in my last post where I highlighted our experiences in France and Monaco per a yacht cruise. 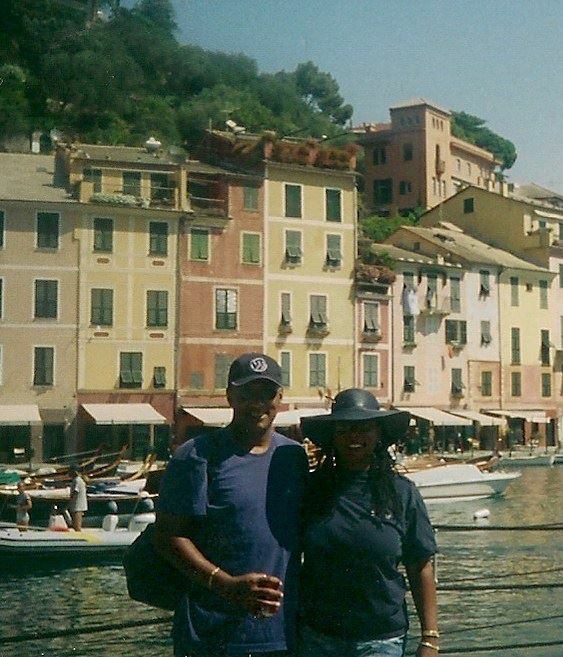 Portofino is absolutely charming. It's one of those quaint cities that is so picturesque that you feel like you are in a postcard setting as you're walking around. It's a cute little fishing village with colorful buildings and beauty all around. There is a restaurant in Miami that my husband and I often go to named Portofino. We love it because the food is delicious and we get to reminisce while there, as there are perfect artists renderings of it at the restaurant. Portofino is a place for romance and love! Basically, it is perhaps accurate to say that you shouldn't do Italy without visiting Rome. Beyond the Colosseum, which is magnificent, there is also Trevi Fountain and other sites, too numerous to list. In Rome, there is a sense of going back in time. History is all around you in terms of ruins and beautiful sites in general. Of course the food is amazing! Being there felt big. There was a sense that although I have traveled much of the world, standing in Rome was outstanding. You can tell, as you walk around, that a lot went down there, historically speaking. Essentially, if you go to Italy, don't miss Rome. It is an absolute must see. Also, try to visit Tivoli nearby. There is a statue there you probably don't want to miss. Our interest in travel to Portugal was essentially to see Lisbon on our way to West Africa. Portugal was the first country in history to participate in slavery, in terms of Africans and the New World. I don't find this to be a positive claim to fame but the city is indeed formidable. In Portugal, we enjoyed a hop on hop off, double decker bus tour. These tours are great when you have limited time, but a lot to see and indeed we did. While there, I bought a fantastic bottle of Port wine. Unfortunately, I forgot to put it in my suitcase and had it in my carry-on when we left so it was confiscated by TSA. That was tremendously disappointing. But, nevertheless, we enjoyed Lisbon. One of our meals was an excellent paella. If paella is made right, you will experience a treat indeed and we did. But I was so eager to get to Africa that perhaps I did not absorb Lisbon thoroughly. We saw the Torre de Belem (tower shaped like a boot), Bairro Alto, Pradrao de Descobremente (Wall of Discoverers/Colonizers) and the Piazza de Mare amongst other sites. Each of these sites were wonderful! Lisbon was worthy and I definitely recommend a visit there. The highlight of the Vatican, was the Sistine Chapel (Michael Angelo), of course. I was intrigued by the fact that although I am not Catholic, the Vatican is the place where the Pope resides. The architecture was incredible and there was a feel to the place that was different from other places in Italy. I loved seeing La Pieta which is Michael Angelo's rendition of Mary and Jesus. The intricacy of this sculpture is phenomenal. The Vatican did not feel like a vacation spot, by any stretch of the word, but more like a religious experience that I am sure for Roman Catholics is a tremendous experience. I do believe it is worth the visit. Essentially, the reason to go to Pisa is to see the leaning tower of Pisa. I remember learning about it as a child in school and finding the notion of a building leaning, very interesting. Although there is a bit more to see there, seeing the leaning tower is essentially sufficient and then you move on. I'm glad we checked that off. Checking it out is definitely fun and interesting! We also took a few side trips which included Verona to see Romeo and Juliette's Balcony and to rub the statue there for good luck. We visited Tivoli near Rome to see the multiple breasted statue (pictured above) and the gardens, Assisi to see and understand the life of St. Francis of Assisi (I find him particularly intriguing because of his love of pets) and Tuscany, where we saw beautiful sunflowers and enjoyed delicious wine. I definitely would love to return to Tuscany and chill out there for awhile. A longer stay would be wonderful there. Below are travel tips that I hope you will find useful for your journeys. Next I will explore Spain, the UK and the Netherlands, which you won't want to miss. Stay tuned! 1. Learn about Tipping Rules in the Place Where You Will Travel. It is not necessary or appropriate to tip in some countries. In Italy, it is not necessary to tip after your meals. 2. If You Travel On A Group Tour, Be Respectful of Other Peoples Time. Usually, the purpose of the organized group tour is to try to see as much as possible in an organized manner, without the hassle of trying to figure out nevery detail out. Hence, there is a time schedule. There are times when you must be on the bus at a certain time and the tour guide has to conduct a headcount. Don't be that person/family that is not on the bus on time, holding everyone up. If you are on a group tour, pack lightly. Since you may be switching hotels and locations frequently, it will be so helpful to you if you and your family are reasonably packed. 4. If You Must Be On A Weight Loss Diet And It Is Not Medically Required At The time Of Your Travel, Wait Until You Get Back Home From Italy. One of the joys of travel is eating, especially in Italy. Why travel all the way there if for the entire time you are concerned about your diet? Italy is NOT a place to deprive yourself in terms of food. It's great to look cute with heels and such, if you like that sought of thing. I am partial to boots so I get it. But when you are on tour and you know you are going to be walking a lot, and cobblestone is in the mix, be kind to your feet and wear shoes and sneakers so you can go the distance. Your feet will appreciate it.